All navy pantsuit with shortened trousers is complemented with a black turtleneck and classic Converse black trainers. Keep the faith! Today’s post will be dedicated to my favorite outfit combination that includes sneakers and skinny jeans. You are going to see best color combinations that are so much easy to copy in real life. Frankly speaking, this combination is nothing new and you won’t surprise anyone on the streets. But there are interesting ways how to make these two basic wardrobe pieces look awesome on you, just make sure to try different colors. Sometimes you need a simple look that works great on the streets. 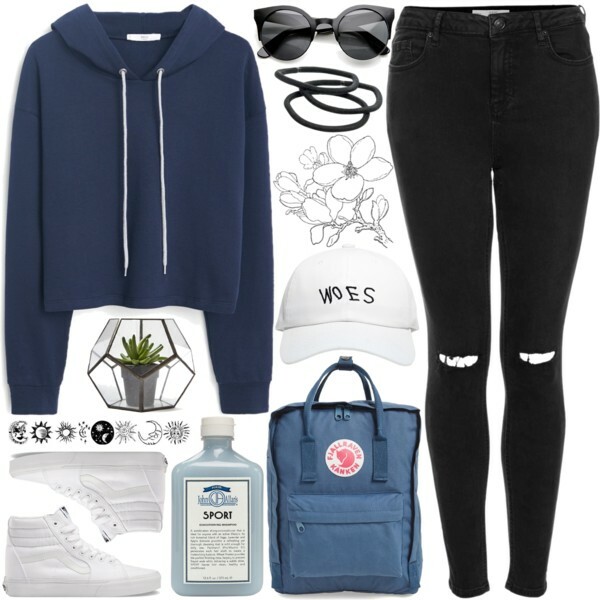 Give a try to these mid-rise black skinnies with ripped knees paired with white high-top sneakers and navy blue hoodie. Complement this outfit with a pair of black rounded sunglasses, white baseball cap, and blue rucksack. The overall outfit looks simple and ideal for casual walks on the town, as well as for airplane trips.